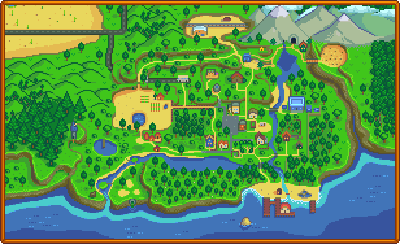 Harvey's Clinic is located in the center of Pelican Town, next to Pierre's General Store. Harvey lives and works at the clinic. Maru works there on Tuesday and Thursday. Both of them often complain about the lack of patients. Most villagers will visit the clinic for their annual checkup. 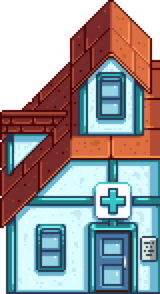 George and Evelyn visit the clinic once per season. Although you can enter the Clinic most days between 9am and 3pm, you cannot purchase medical supplies unless Maru or Harvey is behind the supplies counter. Gifting medical supplies is possible, but both items are universally hated. Note that the start times are when the villager leaves home to travel to the clinic. The end times are when the villager leaves the clinic. 1.3: Red plus sign on front of building changed to blue. Interior red plus signs changed to green or desaturated.